Last week, Google found itself in the midst of a controversy as it mentioned the possibility of serving ads on various device categories. More interesting is the fact that that this was part of the justification Google gave to the SEC to avoid disclosing their mobile ad revenues. Given the scale of their mobile presence and Facebook's disclosures on the subject, why would Google withhold this information? 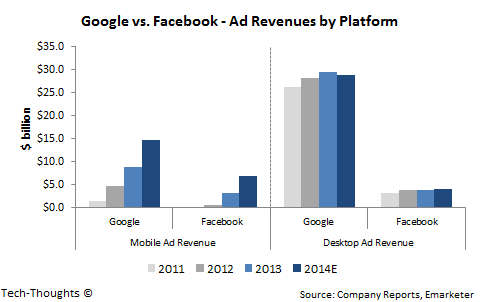 The chart above compares Google's and Facebook's revenue by platform (data from company reports and Emarketer). 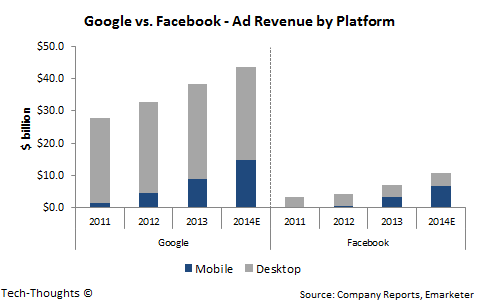 This immediately brings up one possibility -- While Google had an unassailable lead in Desktop ad revenues, Facebook's mobile revenues are comparable to Google's. While Google certainly has avenues to maintain and grow their lead in mobile monetization, they also face a few risks. On the other hand, it is in Facebook's interest to show investors that their ad revenues from mobile have already outpaced those from desktops. The trend above is fairly clear. Mobile advertising is a growth business, while desktop advertising is mature and could begin seeing strong declines. For Facebook, this doesn't create a perception problem as they were far behind Google in Desktop ads. Unfortunately, Desktop ads still drive the majority of Google's revenues. In combination with the point above, any information released by Google has the potential to spook investors. That being said, this is primarily a battle of perception as both companies have very strong growth prospects in the mobile era.